Take a look at the different areas of the Sucre d’Orge online shop (e.g. : clothes > dress and skirt sets) using the top menu. The search engine will display all of the items which match the keyword entered. 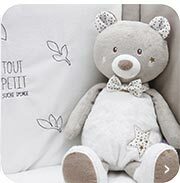 Explore our range of matching baby clothes, toys and blankets and our range of items for bathtime, bedding and bedroom decorating: Select the clothes and the “all collections” tab in the left-hand navigator bar to find a range of items arranged by colour scheme. Clicking on the item will take you to the product data sheet with its description. 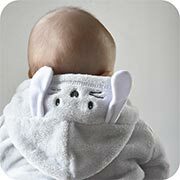 Here you can choose the size, colour and quantity you want, and, on a few items which can be personalised, have your baby's first name embroidered. 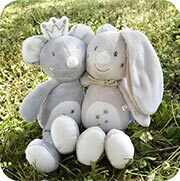 Simple and practical to give a baby its very own personalised birth gift! To order the item, click "Add to basket". 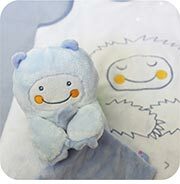 To guarantee that you buy the item or baby gift you want, Sucre d’Orge offers a whole range of complementary items. Items added will remain in your basket throughout your visit to the site. You can amend quantities and add or remove items at any time. To update the price of your basket, click "Evaluate". Set up your customer account if you have not done so already and enter your delivery address. For certain countries, several delivery methods may be available. You can amend your delivery or billing address as necessary. You must observe the terms and conditions of sale in order to submit your order and go to the checkout.